Complex issues call for complex solutions. Civil dialogue is not the solution, but it needs to be an integral part. 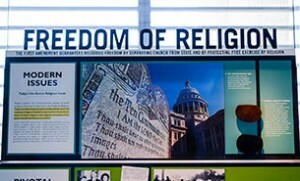 Religious freedom in today’s world is synonymous with controversy. Debates rage around the country on issues that touch our deepest beliefs: abortion, adoption, vaccinations, war memorials, equity and identity. Families and communities are torn apart waiting for courts to sort out the fine and complicated lines between basic human rights and religious liberty. After waiting months if not years for court decisions, communities discover that legal rulings don’t have the power to heal fractured communities. This part of our American story is as old and real as when the first settlers arrived on our shores, but the intensity today feels somehow different. Surely by 2019 we Americans have learned to live together despite our deepest differences! The stark reality is that, no, we haven’t. According to several watchdog organizations and the FBI, religious intolerance and religion-based hate crimes are on the rise; bullying in schools continues to threaten the well-being of our children. Religious leaders and educators share similar stories — we just aren’t equipped to deal with the controversy and division we are experiencing in our classrooms and communities. There is an urgency to do something, coupled with a sense of exhaustion that all we have been doing is simply not working. Over the last 10 years, organizations have emerged to provide resources, training and opportunities for dialogue: Living Room Conversations, Difficult Dialogues National Resource Center, National Institute for Civil Discourse, Generation Global and the Religious Freedom Center are just a few committed to restoring civility and creating intentional spaces for difficult conversations while promoting pluralism and understanding across differences. It is easy to dismiss the value of this work. Someone once described such efforts to me as fluffy. Make no mistake — there is nothing fluffy about dialogue or understanding our differences. Such work takes commitment, constant practice and the courage to stay engaged when things get heated. Any person can engage in informal dialogue by learning the basic skills and finding opportunities to practice them at home, at work, with friends, neighbors and family. Formal dialogue is usually a series of dialogue sessions led by a trained teacher. I’ve met a lot of people who don’t really understand the purpose of dialogue. At the most basic level, it means to seek understanding through words. The purpose of engagement is to learn as much as you can about each other — to share stories, beliefs and perspectives about an issue. It is a space where you can explore an issue from many different sides, so you come to understand the meaning and significance of that issue to each person in the discussion. Dialogue is a place for curiosity — a place where you can ask questions about and explore a perspective with which you completely disagree. It is a space where you can disagree and yet stay engaged. Dialogue is not debate, deliberation, mediation, conflict resolution or problem solving. Its value often is overlooked in favor of rushing to solve a problem or dismissed because people don’t wish to engage with different beliefs, values or perspectives. As a dialogue practitioner, I’ve had opportunity to train thousands of educators, religious and civic leaders. As the religious liberty debates rage around us, as we watch our schools, communities and places of worship become places of controversy and division, as we find ourselves caught in situations that challenge our deepest beliefs, I can attest that dialogue works. I’ve seen it transform classrooms and community groups. I’ve seen educators, community and religious leaders become more confident in helping their students, congregations and communities navigate difficult issues. I’ve heard young people find their voices and become more confident talking about what is meaningful and significant in their lives. I’ve seen prejudice challenged, pain shared and unlikely friendships forged. We should give it a try. This entry was posted in News and tagged civil dialgoue, First Five, hate crime, religious liberty by Religious Freedom Center. Bookmark the permalink.